See here for the film: https://www.youtube.com/watch?v=qpW_HX-neuk. The principle witness to the Rendlesham Forest UFO Incident of 1980 is Larry Warren. In this film he gives us a tour of his old residence near the forest and the location where he had his experience. We also discuss the latest news in the world of RFI research. 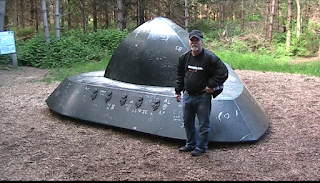 See here for background: http://hpanwo-tv.blogspot.co.uk/2015/07/colonel-halt-returns-to-rendlesham.html. Ditch the Tin Foil Hat?